When there are dozens of things to review before clicking Send, one reminder add-in will simplify your life. 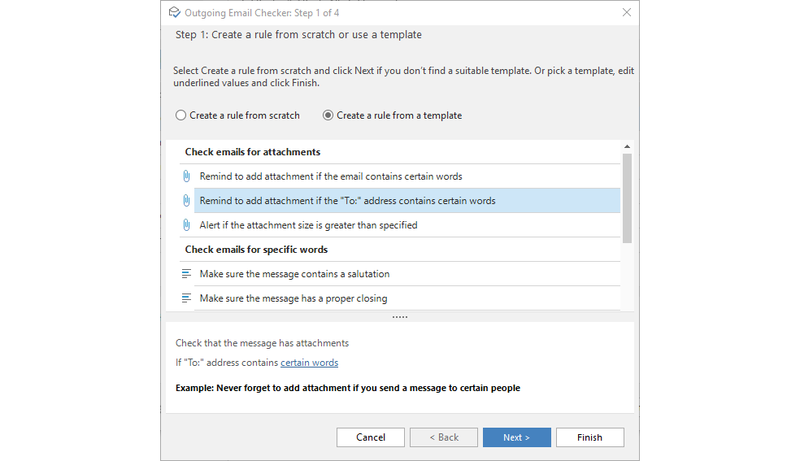 Outgoing Email Checker for Outlook will check your emails before sending for conditions you specify in the rules. Get a reminder to add attachment to your email, be sure to use the right account, prevent replying to all initial recipients, and more. Automatically check emails before sending Create a wide variety of rules using multiple conditions and their combinations to suit all your needs. Scan emails for missing attachments The plug-in monitors the text of your emails and the Subject line and warns if you planned to include an attachment. Never forget to CC or BCC Create a rule for outgoing email - to CC or BCC particular people when you use certain address or domain name. 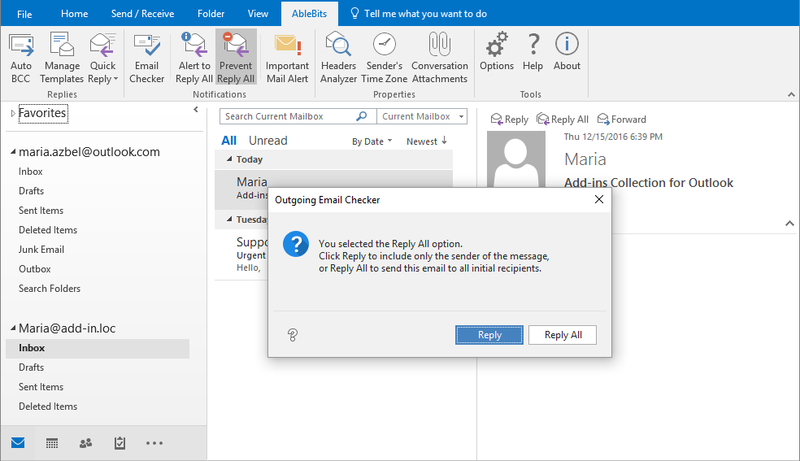 Get the Reply All reminder Enable the Reply All alert and every time you click Reply you will be reminded that there are several original addressees. Use a template or create a new rule from scratch Select the ready-to-use templates or create your new rules. Edit, delete rules, or disable them. Сheck accounts and recipients before sending Outgoing Email Checker will let you avoid sending emails from wrong accounts. Check emails for specific words Avoid silly emailing mistakes, typos, rude words, or spam filter triggers by creating reminder rules. Prevent Reply All With this feature, you can control when you need to include or exclude all initial recipients from your correspondence. What is Outgoing Email Checker and what do I need it for? 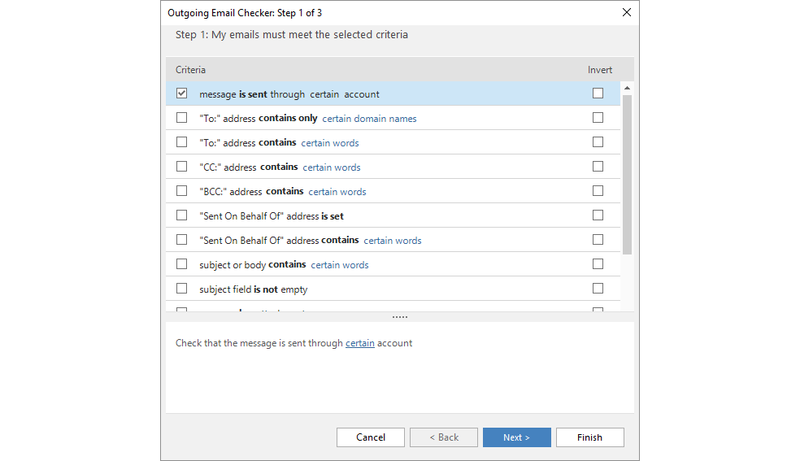 Outgoing Email Checker is an Outlook plug-in that checks your emails before sending them for conditions you specify in the rules. You can create a rule using a template or start from scratch. The add-in will help you avoid most common emailing mistakes: forgetting to add attachment, using the wrong account, hitting Reply All by mistake, forgetting to add CC or BCC recipients, etc. 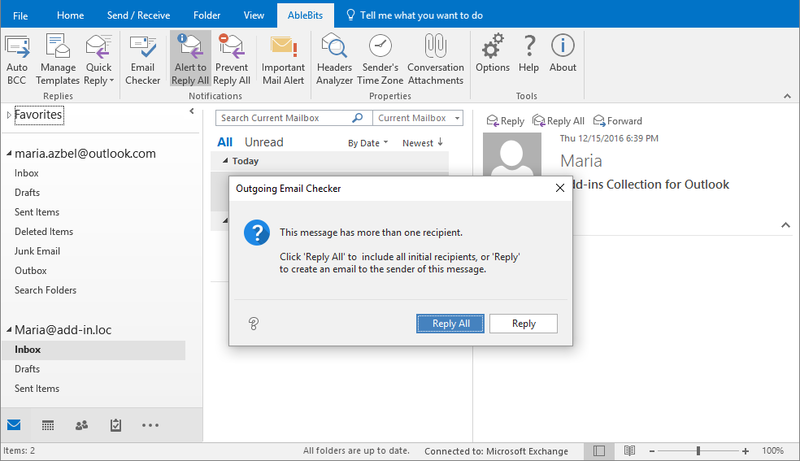 How to use Outgoing Email Checker for Outlook? Install the add-in and run it by clicking the Email Checker icon on the AbleBits tab in Outlook. To create a new rule, click the New rule button and decide if you want to create a new rule from a template or from scratch. Select the criteria for the rule and specify additional details. What if I often forget to add attachments to my Outlook emails? This is not a problem anymore. Outgoing Email Checker monitors the text of your emails as well as the Subject line and warns if you planned to include but forgot an attachment. All you need to do is to enter a list of key words that will trigger the reminder. You can select the ready-to-use template where the key words and phrases are predefined or you can modify this template. For example, the add-in can pop-up an alert when you forget to add an attachment if the email is sent to certain recipient or in case the CC or BCC line contains specific address. Can I check the account I send my message from? Sure. Outgoing Email Checker will let you avoid sending a business email from your personal account. You just need to specify the account and the list of addresses or domain names. The tool will match this list to the needed account and will prompt the correct account before sending. You can add any additional conditions, like checking the account if the letter contains specific words. Is it possible to get a reminder to Cc certain addresses? Yes! Simply create a rule to CC or BCC particular people when you use certain address or domain name in the To field. After that Outgoing Email Checker will notify you if you forget to send a copy of an important message to your manager or coworker. What if I need to check my emails for specific words? The plug-in will help. Unfortunate typos and spam filter triggers are the words one would like to avoid. With Email Checker, you don't need to bother yourself with proofreading especially if you often copy and paste large parts of text into your message. Just enter the list of taboo words and the add-in will scan all your outgoing messages for them and show an alert if there are any. Can I ensure I included certain words into my message? Yes. You can create a rule based on the list of words you'd like to have in your messages sent to particular recipients. Once the rule is created, the add-in lets you approve the email before sending by reminding to include the specified words into your messages. Is it possible to get a warning every time I click Reply instead of Reply all? Sure. You can enable the Reply All alert. If you click Reply, you will be prompted that there are several original addressees and it will always be your conscious choice to include others or not. What if I often click Reply all by mistake? Outgoing Email Checker will help. Just press the Prevent Reply All button under the AbleBits tab to be notified each time you select the Reply All option. With this feature you will control when you need to include or exclude all initial recipients.